In the meantime, Angola won its independence and followed the long socialist road. Bastos went to Portugal and later to Berlin and from there to Brazil, where he became acquainted with some well known musicians, such as Chico Buarque, João do Vale, Elba Ramalho, Djavan and Clara Nunes who had been in Angola in the late seventies. 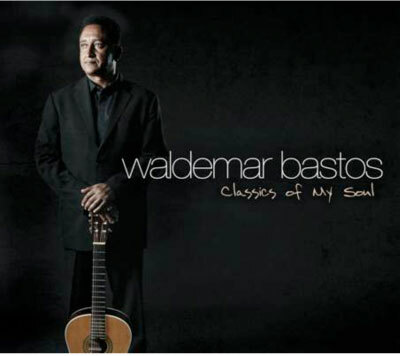 Waldemar finds EMI-Odeon, and records his first album, “Estamos Juntos”. He recorded his second album, the highly praised “Angola Minha Namorada”, five years later. In 1990 he visited Angola, and did a concert before 200.00 people in Luanda. While travelling through Lisbon, David Byrne, the mastermind of Luaka Bop record label, and ex-leader of the “Talking Heads”, bought, by chance, a record of the Angolan singer in a downtown Lisbon shop. Soon after that Waldemar would be featured in the album “Afropea – Telling Stories to the Sea”, an anthology of Lusophone artists issued by Luaka Bop. Afterwards there was “Pretaluz/Blacklight”, recorded in NYC, produced by Arto Lindsay, and issued by Luaka Bop. The New York Times described it as “one of the best World music records of the decade”. In the aftermath of “Pretaluz/Blacklight”, Waldemar won the “Award for the Emerging Artist of the Year (1999)”. In 1998, Waldemar was discovered by the European audience and media. After his successful tours in Europe as the opening act at the UNESCO Festival “Don’t forget Africa“ in June 2000 in the Canary Islands. Later in the year he was invited by Mr. Ruichi Sakamoto to take part in the „Zero-Landmine“ project in cooperation with international artists like Arto Lindsay, Brian Eno, David Sylvian, Jacques Morelenbaum. Bastos is included in Tom Moon’s legendary book “1000 recordings to hear before you die”, and three of his compositions were featured in the Hollywood movie The Sweepers . He received several invitations by Prince Ernst August von Hanover and Princess Caroline von Hanover in the course of which he also gave a private concert for Rainier III. Another highlight was the “Bal de Roses” in Monaco in 2004.